What Is a Good Age to Start Your Child Playing Football? Playing youth sports can be one of the greatest experience of any young person's life. Many parents are more than happy to see their child play sports such as baseball, basketball, soccer, tennis or golf, but some might have trepidation about football participation. At the high school level and above, football is a game associated with serious and catastrophic injuries and parents might think that their child has a chance to get hurt. However, a study by the Institute of Sports Medicine and Athletic Trauma revealed that the injury rate in youth football is anywhere from 1/3 to 1/9 the injury rate in higher levels of football. Playing a hard-hitting and competitive game such as football should not be entered into lightly. The basics of the game are the same at all levels. In order to be successful, every team has to block and tackle successfully. 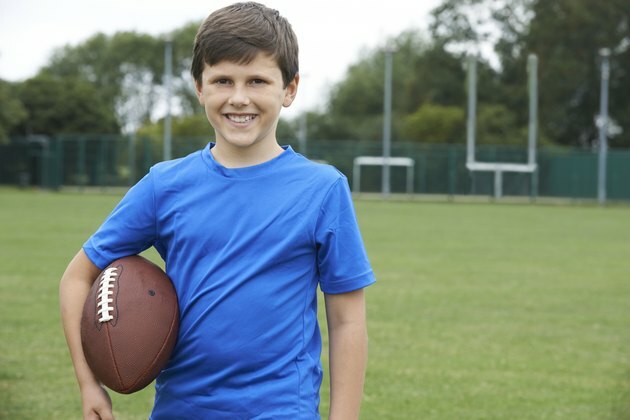 One of the best ways to prepare for tackle football is to play flag football. The National Alliance for Youth Sports says that children who are age 5 to 7 have the necessary motor skills to compete in the game and start learning the skills of football. Youngsters who play football have to understand what is involved before they commit to playing the game. If a youngster wants to sign up for organized football, he and his parents need to know that many leagues practice at least four days a week and also play games once a week. The season will be at least nine games, and there will usually be at least four weeks of practice before the season starts. In order to commit to that long of a season that includes blocking, tackling and other hard-hitting drills, a player needs to be old enough to know what he's getting into. Youngsters who are 9 or 10 might be old enough to make that commitment. Youngsters who play organized football learn the skills of the game, and that might help them become solid players at the grade school and high school level. Many schools have teams for eighth graders, and high school football is open to all players who are freshmen or older. Players who start playing as youngsters have a better chance of competing and becoming good players who enjoy the game than those who pick up the game at an older age. The experience of playing gives most youngsters confidence in themselves to keep on playing. Getting youngsters involved in football at an early age can help get them on a path toward a productive and happy life. The key is to make the experience an enjoyable learning experience says former NFL head coach Tony Dungy. "Coaches who make the experience enjoyable have the best results with their players," Dungy said. "Coaches are there to teach players the fundamentals of the game. Fun is a big part of fundamentals." Putting undue pressure on youngsters to win at all costs and to not make mistakes can take a potentially wonderful experience and turn it into misery. Youth football is not about the coach's won-loss record. It is about teaching youngsters how to play and giving them a chance to learn about teamwork, work ethic and doing their best. Coaches and parents who fail to realize this might end up emotionally hurting their youngsters. Is It Possible to Learn Soccer in Your 20s?